Stand on the grass inside Texas A&M’s newly renovated Kyle Field on gameday and the 102,000 tradition-laden fans will overwhelm. That’s exactly what coaches and players want. But Kyle Field fills like that just a handful of times a year. What can be done to capture that experience the rest of the year, as a way to give recruits and visitors an experiential glimpse into Kyle Field? Well, create it all for them. That’s where graphic designers enter the fray. At Populous, one of the largest and most prolific stadium architecture firms in the world with over 20 MLB stadiums and countless other world-class buildings to their name, Brian Mirakian directs the Populous Activate division, in charge of everything from stadium signage to large-scale graphic treatments to recreating the gameday experience. 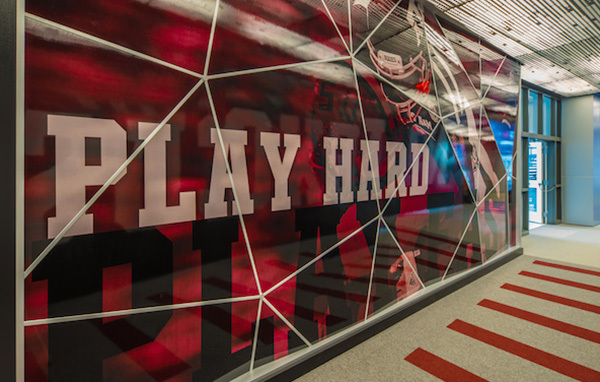 The completely remodeled Texas A&M facilities, including the training center, are full of bold design meant to inspire players and impress recruits. But nothing impresses quite like the glass tower in the main atrium that comes alive. Using infrared, the panoramic tower activates an audio-visual sensory experience that captures the atmosphere of being in Kyle Field. “That visitor or recruit is able to understand everything of what makes gameday tradition so amazing,” Mirakian says. The use of technology and digital design has seen a dramatic uptick in the last five years, he says. “The buildings have just become so much more interconnected and sensory and not just with training facilities,” Mirakian says. “Even concession media boards, advertising panels in the building and ribbon boards.” Advertising, in part, has pushed the move with the ability to brand an entire stadium with one company at one time a major revenue generator. As that stadium-wide digital endeavor grows, it extends to the locker rooms. At Kyle Field each locker has animated displays with that player’s headshot, name, Twitter handle and hometown. Mirakian says that while using digital design modernizes and evolves design, more importantly it serves the client. And while Kyle Field’s new digital design will take center stage when the completely renovated structure opens this September for SEC football, not everything is about creating a digital world. Mirakian says stadium design comes down to understanding a client. From there, signage and wayfinding play a major role, just because of the sheer size of the structures. And then you have all the premium amenities of club spaces, suites, hospitality and even the branding and design of all the concession areas that need to catch the eye and capture the imagination of the paying customer. Often Populous will create their own typography to represent a voice for a building or the venue’s owner. Exhaustive image selection can lead them to customize and tailor photo shoots to capture the style they desire. Take Texas A&M. The tradition of the campus plays heavily in the design within the stadium, but the client’s desire to show off its progressive research side allows the design to evolve beyond the architectural form. Just like that interactive glass tower.